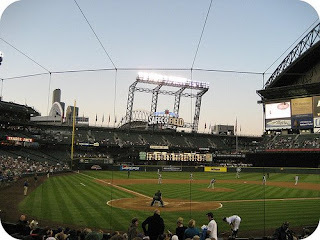 Yesterday was a fun day, we went to Seattle to watch a Mariners game, they lost, but it was still fun. The only problem is that we got home super late, and now I'm getting ready to go to work and I hurt... lol... I feel like an old lady, specially because I am complaining about it! Anyhoo, this has been a good week, I've had a blast on Monday and Tuesday (my days off), got lots of things done and I'm extremely excited to see my front yard looking good (we have sod being delivered today! ).